This is part five of eight posts about your chakras. We started with your root chakra, have moved now to your heart chakra and are working our way up to your crown. 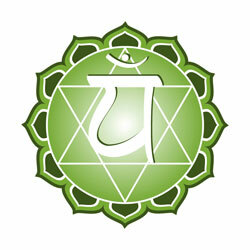 Your heart chakra, or anahata, is located at the center of your chest at heart level. It is the center of your deep bonds with other beings, your sense of caring and compassion, your feelings of self-love, altruism, generosity, kindness, and respect. The energy of anahata allows us to recognize that we are part of something larger, that we are interconnected within an intricate web of relationships extending through life and the universe. An open heart chakra means living your life with loving kindness and compassion towards others. It means that your heart is open to others and you inspire kindness and compassion in others. You create safe and supportive environment. Or, hit the mat: One of my favorite heart openers is camel pose, or ushtrasana. Kneeling on the floor with your legs hip width apart, release your weight down through the knees and legs into the earth. Press your shins and the tops of your feet into the floor. Place your hands on the back of your hips. Inhale and slowly lift your heart up at the breastbone and allow your hips to move forward. Draw your shoulder blades back as you move into the position. When you can’t go back any further, reach with your fingertips towards your heels. With full control, take your head back Draw the shoulder blades together. Camel pose is a strong asana that opens up your chest area, exposing you, making you vulnerable and more open to giving and receiving love. Don’t be alarmed if you feel a lot of emotions arise after coming out of this pose. This yoga asana stretches the entire front of the body, abdomen, chest, and throat, as well as deep hip flexors – the psoas muscle. It strengthens your back muscles and stimulates organs in the abdomen. Rest in child’s pose to stretch the back muscles.